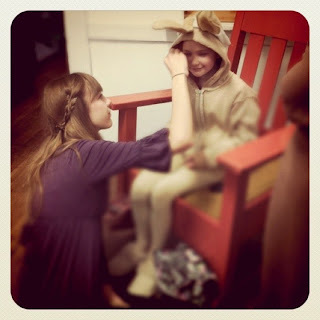 sewing in the past: velveteen rabbit musings. 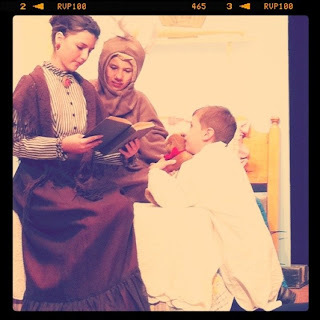 the drama jr production of "the velveteen rabbit" is over! it was such a fun experience being backstage. i'd never done that before. and i'm so glad i got to see a different side of theatre...instead of the one found ONstage. i can't wait to try even more things, such as tech, etc. i'm also excited to learn more about stage makeup and hair. i don't hardly know ANYTHING about it, so when little kids would come up to me for bunny noses, etc. i'd have to send them to maddy (pictured above) who is a natural at those sort of things. by the last performance, i was doing pretty well...but i'd LOVE to take some classes and get some really professional instruction about stage makeup and hair.